Art Deco Jewelry - This is a fabulous sterling silver geometric statement pendant that frames accents an oval black onyx cabochon. This limited edition handcrafted necklace includes a 24" handmade adjustable chain. 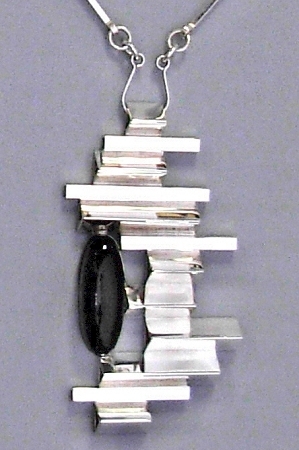 A beautiful modern sterling silver pendant with an oval shaped high dome black onyx. This linear piece is constructed from triangle sterling silver tubing and includes a sterling silver adjustable chain and is signed and created by Aaron Rubinstein and Modern Art Jewelry.